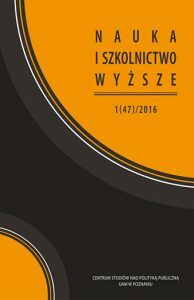 Another issue of „Science and Higher Education” (Nauka i Szkolnictwo Wyższe) is available now online and in print, 197 pages. A full PDF version of the issue is available from here. „Science and Higher Education” is the only Polish academic journal focused exclusively on higher education research. Marek Kwiek is its editor in chief and Krystian Szadkowski is its managing editor. Marek Kwiek’s Introduction is on „Deprivatization of higher education in Poland. What it means? What are its consequences?„. Simon Marginson’s paper is on „Public/private in higher education: A synthesis of economic and political approaches” (in a Polish translation). Marek Kwiek // Wprowadzenie. Deprywatyzacja szkolnictwa wyższego w Polsce. Co oznacza i jakie niesie konsekwencje? Piotr Rodzik // Nadane stopnie i tytuły naukowe – czy coś się zmieniło?